Norway is a Scandinavian country in northern Europe and a beautiful place. Following is a summary of background information you should know before taking a trip. The official name of Norway is the Kingdom of Norway. The country covers an area of mainland and accompanying island territories. The total size of Norway is approximately 150,000 square miles. For comparison purposes, this makes the country slightly larger than the State of New Mexico in the United States. The capital of the Kingdom of Norway is Oslo, which is also the biggest population center with over 520,000 residents. Other major cities of note include Bergen with just under a quarter of a million residents, Trondheim with 150,000 residents and Stavanger with roughly 110,000 residents. 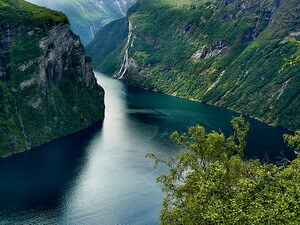 The terrain of Norway can be described as extreme with high plateaus, steep fjords, mountains, and fertile valleys. The climate is temperate along the coast, but much colder inland. With its far north location, Norway experiences very long days during summer months and equally long nights during winter. During summer, it can stay light until close to midnight. Citizens of Norway are known as Norwegians. The most recent estimate of the total population for Norway was 4,593,000 in 2006. The population is not exactly expanding with annual growth rate just above zero at .41 percent. To provide perspective, there is approximately one Norwegian for every 15 square miles of land. Ethnicity in Norway is primarily a blend of peoples from the Scandinavian countries in antiquity. The dominant majority is a mix of Nordic, Alpine and Baltic peoples intermixed over time. Norway does not have a strong immigrant movement with only 300,000 immigrants as of 2005. From a religious perspective, the Church of Norway is the dominant faith with over 87 percent of Norwegians claiming it as their faith. The Church of Norway is a Lutheran denomination. No other religion is able to claim more than two percent of the population as followers, but pockets of Pentecostal Christian, Roman Catholic and Muslim can be found here and there. The Kingdom of Norway has two official languages - Bokmaal Norwegian and Nynorsk Norwegian. English is also widely spoken by most and taught in the school system. Small pockets of Sami and Finish speaking minorities also exist. Although statistically impossible, Norway claims a literacy rate of 100 percent. The true number if probably not much less due to compulsory education. Life expectancy for male Norwegians is 76 years of age, while women live an additional five years on average. As this background information reveals, this country to the far north has led a somewhat isolated existence. That being said, the people are universally pleasant and the country is stunningly beautiful. About the Author - Richard Monk is with FactsMonk.com- a site with facts about everything. Visit us to read more about Europe.